On May 12, 2012 the Sandwich Historical Society sponsored the event Niobe and the Great Wall of Sandwich. 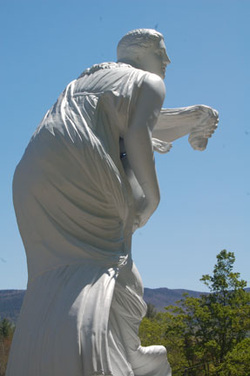 The program featured the unveiling of the restored seven-foot tall zinc statue of the Greek mythological character Niobe, whom the gods punished for her hubris. The statue is believed to have been cast by the 19th century Prussian master, Moritz Geiss, circa 1860. The retired industrial magnate, Isaac Adams, purchased the statue for his estate in Sandwich. 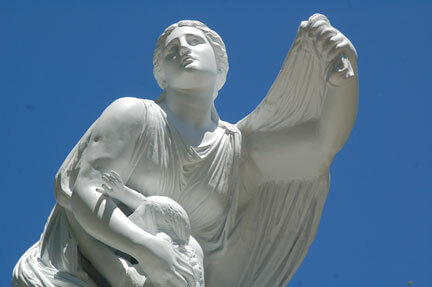 In 1875, Adams placed Niobe on a pedestal that is part of the “Great Wall of Sandwich.” Unfortunately, the statue was toppled during a storm in 1941 and was severely damaged. After languishing 70 years in a heap of shards under a manure pile, she was fully restored in 2011. The program included special guests Adam Nudd-Homeyer, the artisan who reassembled the shattered statue and restored it to its original beauty, and Carol Grissom, Senior Objects Conservator at the Smithsonian Institution’s Museum Conservation Institute, a leading authority on zinc statuary. • The “Great Wall of Sandwich,” a massive mile-long, shoulder-height structure constructed on both sides of split feathered granite and filled with combed field stones, that was built by Isaac Adams during 1874-1875. Click here to read the history of Niobe and the Great Wall.